We're trying to make room for new shipments and we MUST MUST MUST clear out the excess inventory in our store and warehouse!!! We're moving them out by offering great deals in our store and at e-BAY!!! Check them out by clicking anywhere in this box to go to our ebay auctions!!! SAVE UP TO 80% OFF THE PRICE OF FIRST QUALITY, MAJOR NAME BRAND MATTRESSES AT SUPERIOR BEDDING! 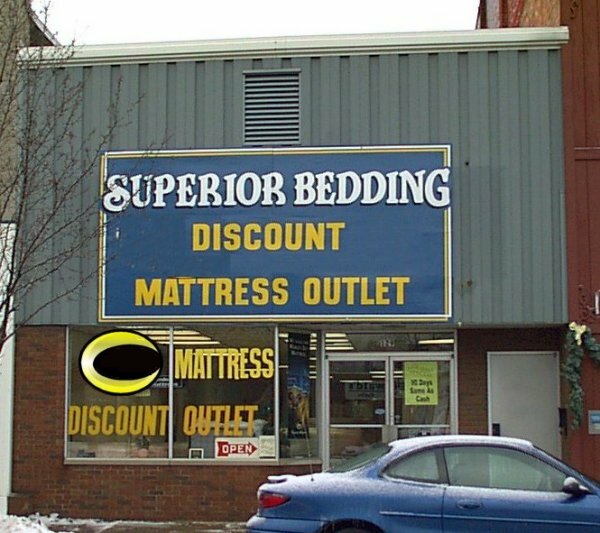 SUPERIOR BEDDING, A Family Owned Business For Over 35 Years, Brings You First Quality, Brand Name Mattresses At Such Low Prices Some Of Our Suppliers Won't Let Us Publish Them On Our Website!!! Because we shop smarter, you can buy name brand mattresses from us at or BELOW REGULAR WHOLESALE PRICES!!! We buy name brand FIRST QUALITY mattress closeouts, overstocks, and store liquidations at HUGE discounts and then pass the savings on to YOU! Our low overhead and high volume purchasing allows us to give YOU the greatest value of any mattress store in America and that saves you MONEY!!! Located Right In The Heart Of Downtown Grove City, PA.
From Your Door To Ours! We offer FREE delivery within 10 Miles of Grove City, Pennsylvania!